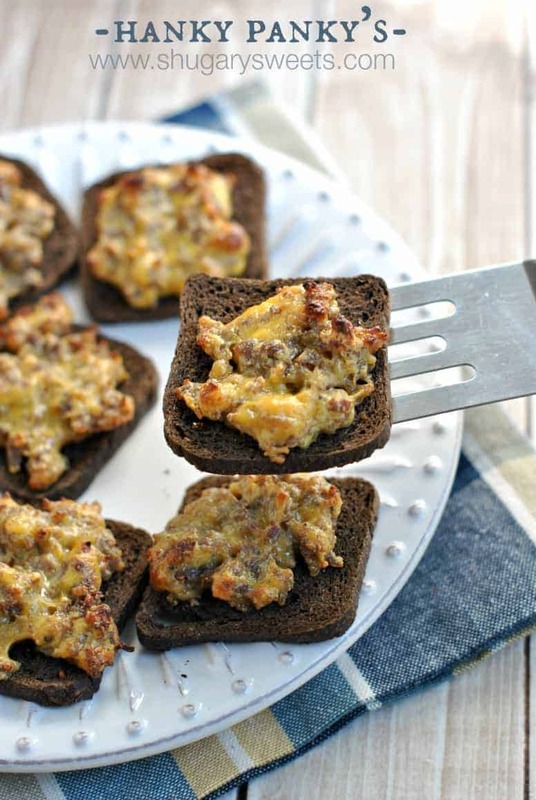 Looking for an easy appetizer idea? 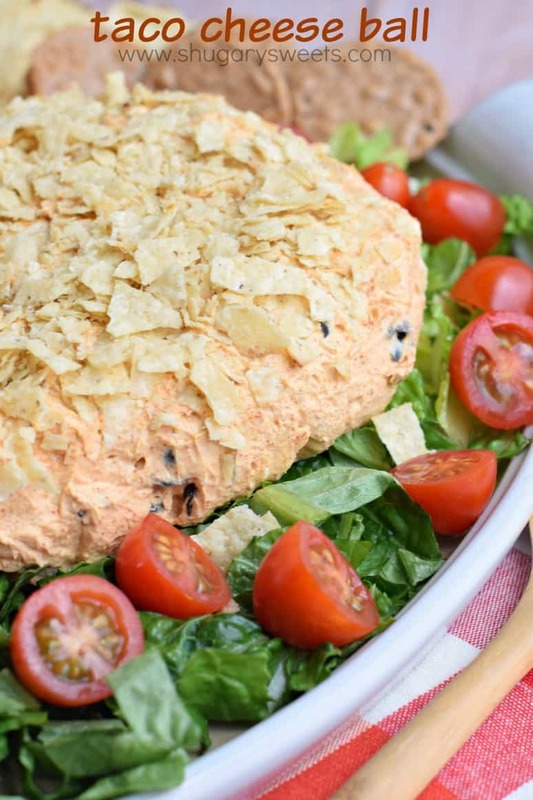 This Taco Cheese Ball is packed with flavor, and easy to make too! I have a serious snacking problem. I can turn my head to the sweets…but if there is a bowl of Doritos on the table, game over. I look forward to potlucks and family gatherings because I know there will be an assortment of SNACKS. I wander the snack aisle in the grocery store for longer than I should, waiting to see WHICH bag of salty goodness is calling my name this week. And then there is dip. 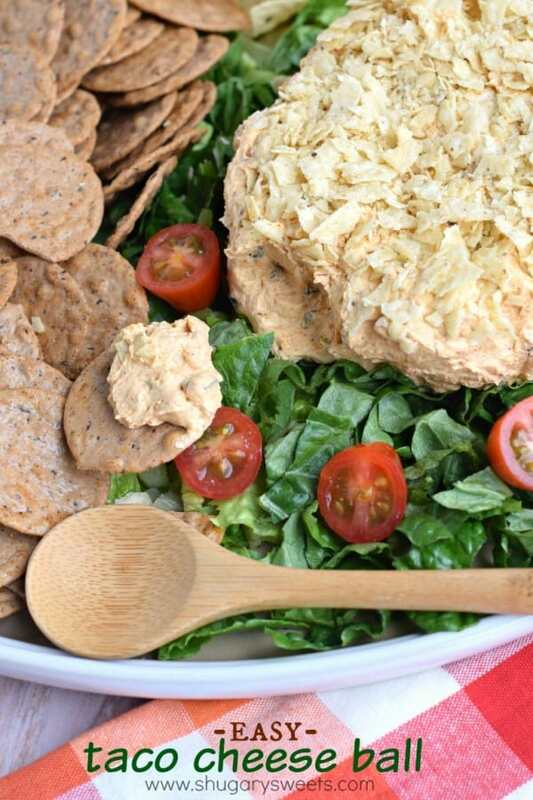 Holy cow do I love to swipe a cracker or chip into a creamy, zesty dip. Today’s dip recipe fits that description. Creamy. Zesty. Swipable (is that a description??). 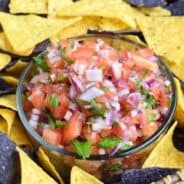 I whipped up this dip awhile back, and am planning on making it again this weekend, it’s so good! First you need to create your cheese ball. I combine all my ingredients in a mixing bowl. I then line a 4 cup bowl with plastic wrap. Drop all the dip into the lined bowl and wrap the plastic wrap over the top. Refrigerate this mixture for at least an hour (more is even better, allowing the flavors to mingle). Right before serving, unwrap the plastic wrap and fill a bowl with crushed tortilla chips (or Doritos!). 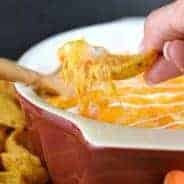 Drop the cheese ball into the crushed chips and press them gently onto the ball. Place the cheese ball on a bed of chopped lettuce. Add tomatoes to the platter and serve with crackers or chips! This is a great recipe for your next summer bbq or potluck. You can keep it cool in your cooler and then serve it when needed. You can skip the crushed chips too, and just serve it with chips instead. You can also just serve it out of a bowl and skip making it into a ball shape! Options people. That’s what I’m here for. 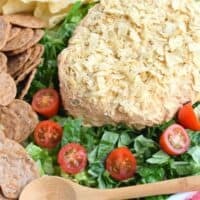 Taco cheese ball rolled in tortilla chips! In a large mixing bowl, beat cream cheese with taco seasoning until well blended. Add in jalapenos and black olives. Line a 4 cup bowl with plastic wrap. Drop cheese ball into bowl and wrap the plastic around the cheese ball. Refrigerate for at least one hour (more is even better to allow the flavors to mingle). 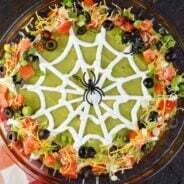 When ready to serve, place shredded lettuce and tomatoes on a serving platter. Fill a bowl with the crushed chips. Unwrap cheese ball and drop into bowl, pressing the chips gently onto the ball. 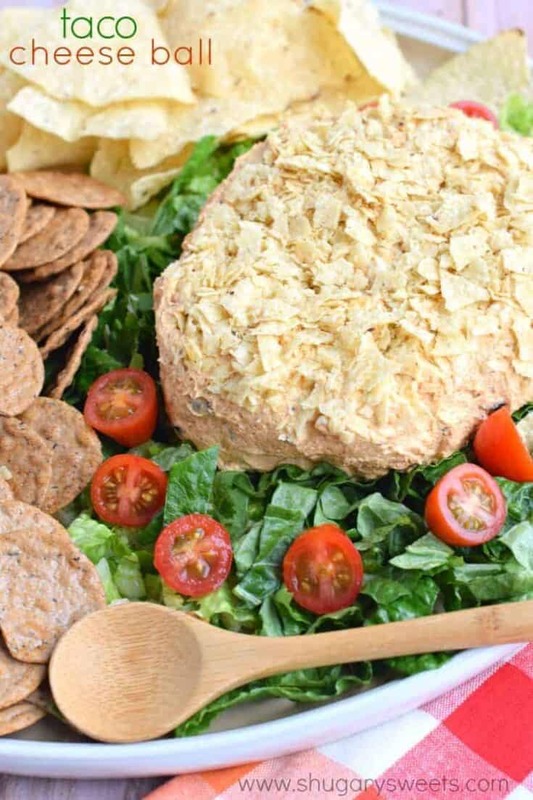 Place cheese ball on platter and serve with extra chips and crackers ENJOY. 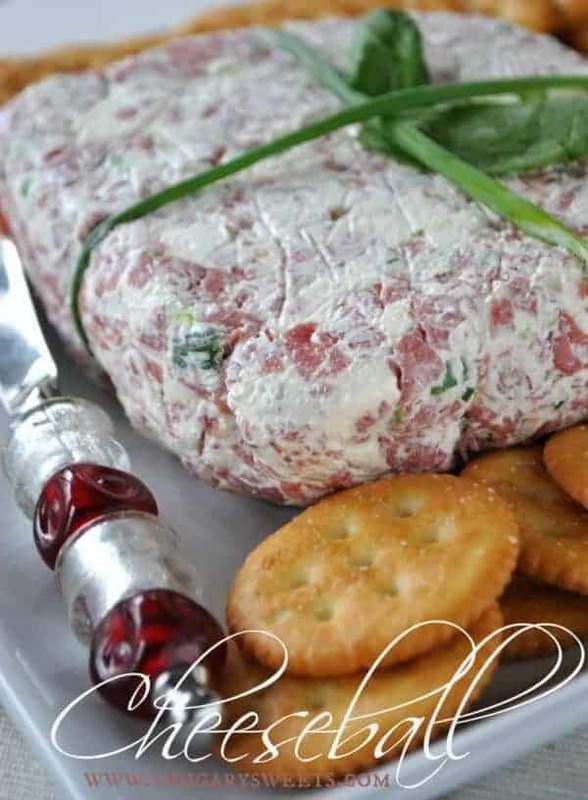 This savory beef and onion Cheese Ball recipe is a family treasure! Hanky Panky’s are served at all our family events! These zesty, cheesy bites are addictive! 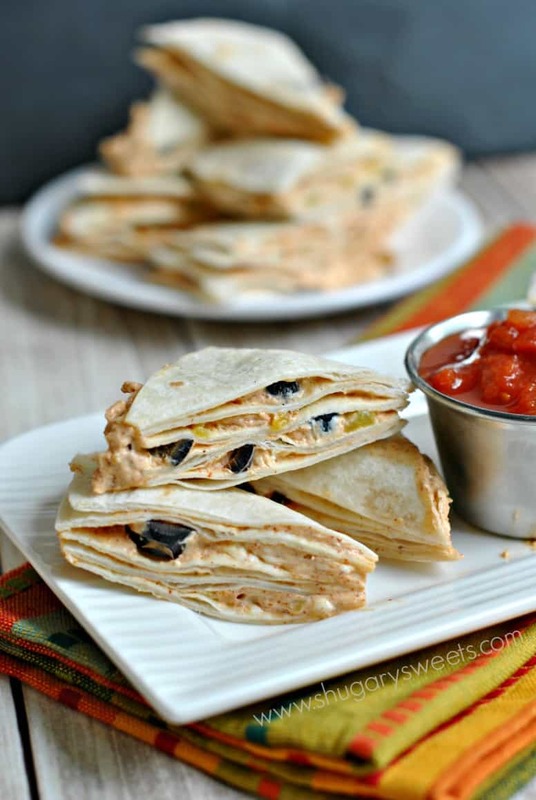 Taco Tortilla Stacks: the delicious inspiration to today’s cheese ball recipe! I have a total love for cheeseballs. They are always so delicious and always a big hit at parties. Love this taco version….so good! What a great idea for a party! I would not be able to stop eating this. I love Cinco de Mayo since I love Mexican Food. This cheeseball would disappear in no time flat at our house. Thanks for sharing. Swipeable is most definitely a description! This looks like a great snack to bring to friends house for the evening! I couldn’t help myself from snacking if I had such a yummy cheese ball hanging around 🙂 What a great thing to bring to a summer BBQ! Cheese is my JAM. And this taco take on the classic cheese ball will definitely disappear at my house!